SPAIN, Castile and Leon. Pedro I, AD 1350 to 1368. Silver real. Pedro (or Peter) the 1st was also known as Pedro the cruel because of a series of murders he commited after 1356. But some of his followers also called him Pedro the executor of justice, claiming that the men he killed were criminals in need of such justice. Date : 1350 to 1368. Size : 24.8 x 25.3 mm. Weight : 3.42 grams. Grade : aXF with just the tops of a few letters off the flan. 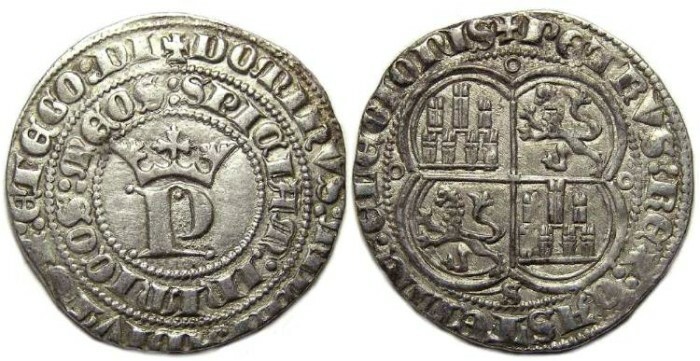 Obverse : Crowned P with two rings of inscription. The inner ring reads SPICIAM INIMICOS MEOS and the outer ring reads DOMINVS MICHI ADIVTOR ET EGO DI. Reverse : Arms of Castile and Leon, with PETRVS REX CASTELLE E LEGIONIS around.